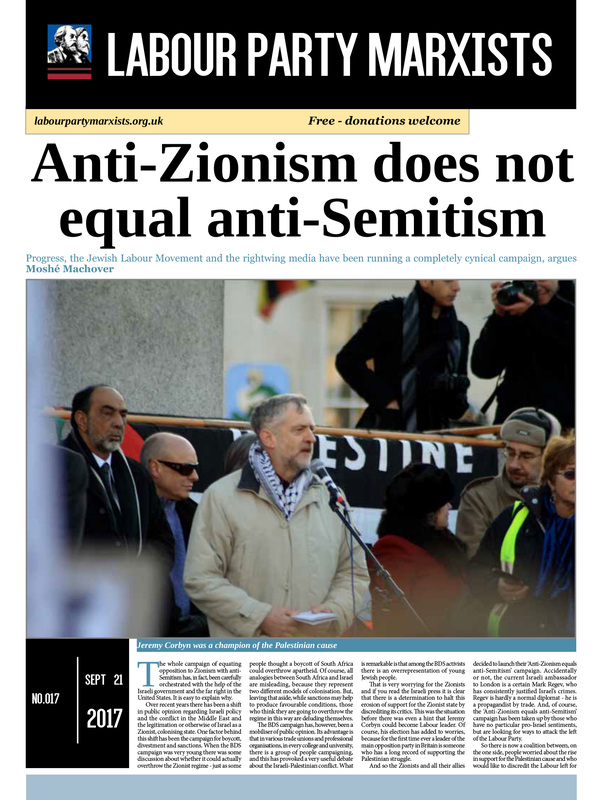 Reports of the AGM of the Jewish Labour Movement have been splashed all over the bourgeois media, because it voted “almost unanimously” for a motion stating that “the leadership of the Labour Party have demonstrated that they are anti-Semitic and have presided over a culture of anti- Semitism”; that “Jeremy Corbyn is unfit to be prime minister and that a Labour government led by him would not be in the interest of British Jews”; and that therefore the JLM has “no confidence” in Corbyn. So far, so predictable. 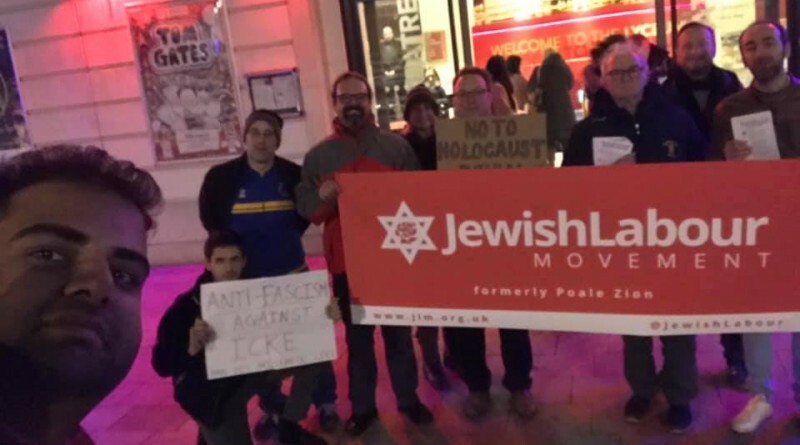 Gathered in the JLM are, after all, some of the most vile rightwingers who have been plotting against Jeremy Corbyn from day one – ie, long before the smear campaign to equate anti-Zionism with anti-Semitism really took off. You would have thought that this campaign – which has proven so incredibly successful since then and has led to the suspensions and expulsions of thousands of Corbyn supporters – would have led to a massive influx into the JLM. But we read that in “the closest vote of the day” a mere 148 people took part. And apparently that is not down to huge numbers of abstentions, as elsewhere an attendance of 160 has been reported. 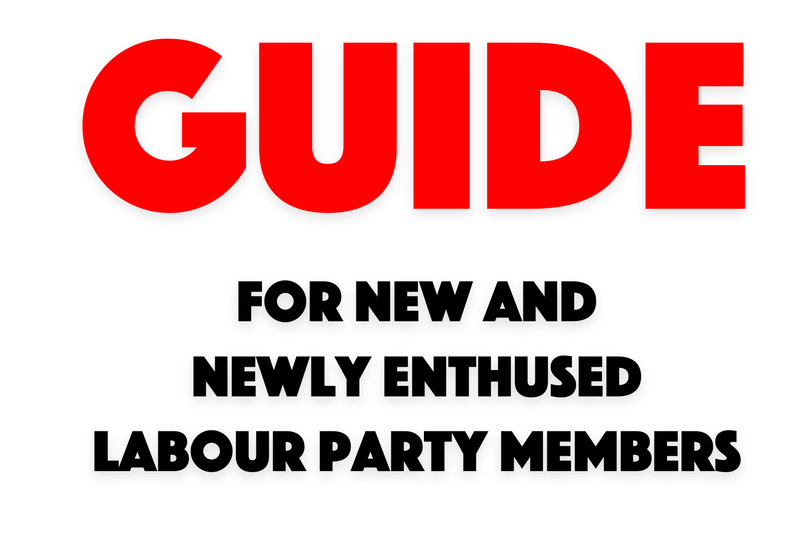 Now remember, you do not have to be Jewish or a Labour Party member to join the JLM – for example, Gordon Brown recently signed up. He thought it would be a good idea to join his former nemesis, Tony Blair, and engage in a bit of anti-Corbyn propaganda just before the local elections. He ‘stars’ in a video produced by Hope Not Hate – or ‘No Hope, Hate Corbyn’ as it should henceforth be known. In the video, Brown claims that “the Labour Party has let the Jewish community and itself down. They should never have allowed legitimate criticism, that I share, of the current Israeli government to act as a cover for the demonisation of the entire Jewish people.” Who exactly is ‘demonising’ the entire Jewish population, Gordon? Anyway, on this basis, 160 members coming to an AGM is, to put it mildly, pathetic. This organisation claims to be “the” voice of Jewish members in the Labour Party. Clearly it is not. 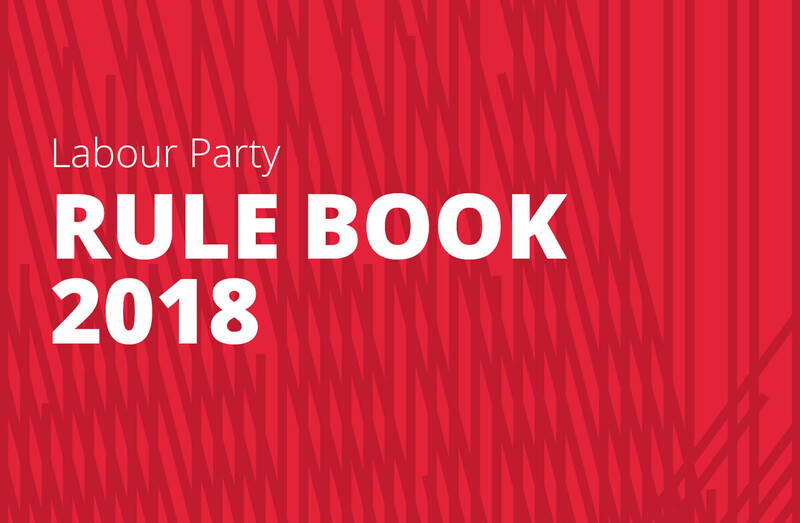 Jewish Voice for Labour should reconsider its policy of not publishing its membership figures, because it would quite clearly and easily trump this hands down. This “closest vote of the day” does affect the JVL, as it happens. And it makes for interesting reading. The main motion (besides expressing no confidence in Corbyn) concerned itself, naturally, with anti-Semitism. After all, that is the main reason why the JLM, which was pretty inactive for a number of years, relaunched in 2015 with the expressed aim of harming Jeremy Corbyn, as the award-winning Electronic Intifada has uncovered. This main motion contained a sentence that charged Momentum, the Campaign for Labour Party Democracy and the Labour Representation Committee as having “acted … to protect and support those engaging in anti-Semitism”. This displays a considerable lack of actual knowledge when it comes to the left of the party. The CLPD has been shamefully quiet on the witch-hunt against Corbyn supporters. As for Momentum – or, more precisely, its owner, Jon Lansman – it has been playing a very active role … on the side of the witch-hunters: as soon as Jackie Walker was first suspended from the party (over charges that were later dropped because they were so flimsy), Lansman immediately moved to have her removed as vice-chair of Momentum – with the help of the pro-Zionist Alliance for Workers’ Liberty, who were in turn booted out during his coup of January 10 2017. He then turned on his long-term comrade in the CLPD, Pete Willsman, when he was accused of being soft on anti-Semitism, removing him from the Momentum-endorsed list of candidates for Labour’s national executive committee (Willsman was re-elected nevertheless). When Chris Williamson MP was suspended for stating that the party had “apologised too much” over the charge of anti-Semitism, Lansman did not say a word in his defence – but a day later publicised and spread a letter, in which Labour Party members “sincerely apologise to the Jewish community over our collective failure on the issue”, using similar vocabulary to that of Chris Williamson, but, of course, stating the opposite. In other words, it is a vile, scabbing letter. And that is the role that Jon Lansman has been playing for some time: he is a scab who is not just happy to throw Corbyn supporters to the wolves, but is actively undermining Jeremy Corbyn himself. The majority at the JLM AGM, however, seems to have recognised that, in fact, Momentum is not the enemy any longer and that Jon Lansman has been acting like a witch-finder general. An amendment was moved to delete Momentum from the list of organisations said to be ‘protecting’ and ‘supporting’ anti-Semites – and replace it with Jewish Voice for Labour. That does indeed make a lot more sense. Indeed it has. The mover could have added plenty of other examples of Momentum – just like the JLM – propagating and fostering the lie that Labour is overrun with anti-Semites. Not everybody in the room was convinced – too deep-seated is their hatred of what they conceive to be the left, no doubt. But 81 voted in favour of the amendment, while 67 were against. Did the latter figure include Ruth Smeeth MP, who replaces Luciana Berger as national parliamentary chair of the JLM? After all, just after the AGM she claimed on Sky News that Jeremy Corbyn was, in fact, “responsible for anti-Semitism inside and outside of the party” (my emphasis). At the AGM, Ella Rose was elected unopposed as “JLM network officer” – no prizes for guessing who she might be networking with. But the main question that springs to mind is: why on earth is this rightwing outfit allowed to remain a Labour Party affiliate? ← Where are our trigger ballots? 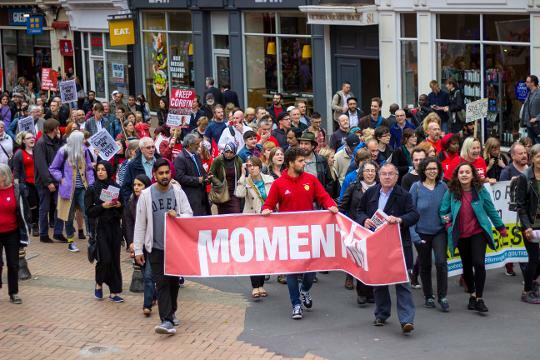 March 15, 2017 Comments Off on Momentum Grassroots conference: Against Jon Lansman, for what?